With its unique silver finish, the silver BOPP (biaxially oriented polypropylene film) roll label material is water, oil and moisture resistant. 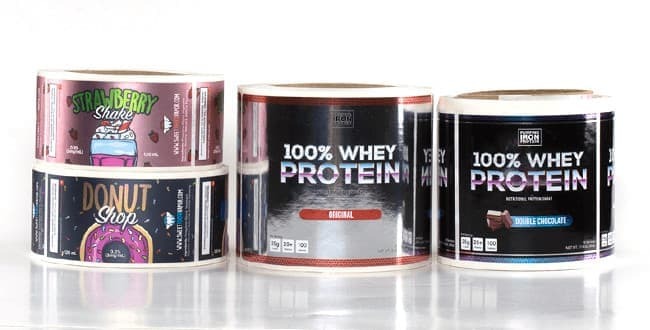 This highly reflective material is great for use on candles, wines, bottles, vitamins and other nutraceutical products, including whey protein containers. Shiny with a “mirror like” appearance, the silver BOPP material is a sure eye-catcher, as it appears to have almost a chrome finish. With it’s water and weather resistant properties, incorporating this label material into your application makes you the shining star of the show! Add white ink to your artwork and wowza - your branding jumps right off the label! Or, if you prefer more of a "retro" look and feel, we suggest adding some color to your label, as color on the silver BOPP material appears very metallic, almost resembling a holographic appearance.